Dubai Parks & Resorts has confirmed that Motiongate – one of three theme parks it currently has under development – will open in October. The theme park promises an experience based on some of the world’s most-loved modern family movies including Shrek, Kung Fu Panda, Hotel Transylvania, The Hunger Games and The Green Hornet. Twenty-seven rides will feature in total. Stars from the films, including popular cartoon characters, will make an appearance at the opening ceremony to entertain guests, park executives have revealed. “We are taking guests beyond the screen, into a world of cinematic adventure at Motiongate Dubai with an action-packed line-up of Hollywood-inspired rides and attractions, from fast-paced roller coasters and multisensory theatre shows to imaginative play areas," said Guido Zucchi, Motiongate general manager. 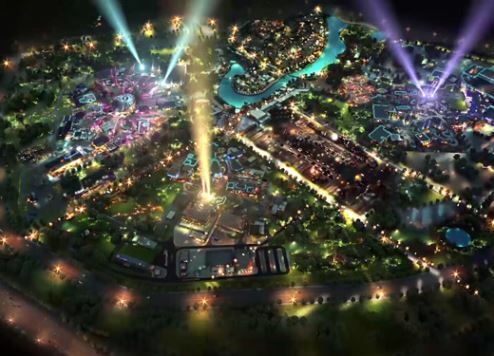 Motiongate is part of the AED10.5 billion (US$2.86 billion) Dubai Parks and Resorts development, a 2.3-million-square-metre precinct located opposite Palm Jebel Ali. The park will be split into five zones: Studio Central, which is the park’s entry boulevard, designed to replicate a working movie set in New York City; Sony Pictures Studios, featuring seven attractions based on Cloudy with a Chance of Meatballs, Hotel Transylvania, and Ghostbusters; Dreamworks, which has 12 attractions inspired by How to Train your Dragon, Kung Fu Panda, Madagascar and Shrek; Lionsgate, which has the world’s first theme park attractions based on The Hunger Games; as well as Smurfs Village, with five attractions geared to younger visitors. The park’s director of entertainment, Elaine Hinds, said Motiongate would open the same day as the Bollywood and Legoland parks. “Each ride is different and offers something for everyone. The movie studios themselves are excited about the park," she said.